Kraus Global Ltd., a global innovator and manufacturer of alternative fuel dispensing solutions, has introduced Metered CNG Fill Post Systems to the Compressed Natural Gas marketplace. Filling an equipment gap in the industry, this advanced intelligent post control system provides accurate metering from each vehicle hose. Embedded data acquisition architecture reports relevant historical and real time data, providing station owners and fleet managers a customizable summary of the health of the station and fleet. Metering of fleet vehicle fills has always been a challenge, primarily due to cost and complexity. This challenge has been overcome through streamlining the necessary infrastructure and metering process using Kraus Global’s advanced MICON NEXTGEN 1.0® controller to extract and synthesize relevant data. System capabilities include enhanced fleet tracking, priority filling control, top-up routine, connection to fuel management systems, and more. 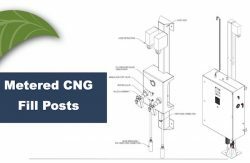 Existing time fill stations can be upgraded into the Kraus Metered CNG Fill Post System by retrofitting existing posts with a Kraus Fill Post Retrofit Kit and integrating the Kraus Control Panels to the site. This upgrade reuses existing compression, storage, and filling infrastructure making the total upgrade cost effective and easy to install. President and CEO of Kraus Global Ltd., Ossama AbouZeid, said he is pleased with customer interest and believes support will continue to grow. “Beta testing of the Metered CNG Fill Post System is underway and going as planned. The system provides beneficial data and offers great advantage to those planning on installing time fill stations in the future. This new solution has caused tremendous customer excitement, especially given the option to retrofit existing time fill stations with this enhanced capability,” AbouZeid said. AbouZeid stated Kraus Global is partnering with Ozinga Energy at the initial beta site. The Metered CNG Fill Post Solution will be on display at Ozinga Energy’s booth at Waste Expo (#1617) in Las Vegas, April 24-26, and again at ACT Expo (#856) in Long Beach, May 1-2.